Photo courtesy of Ben Edwards. You don’t need to be an earth scientist to appreciate Iceland’s spectacular landscape, but it definitely enhances the experience. Etched in the ice-capped peaks, rocky cliffs, black-sand beaches, glacier lakes and craggy lava fields are signs of the Earth’s history, climate and continuing evolutions—if you can decipher the clues. Nineteen Dickinsonians were hot on that trail when they adventured to Iceland this past summer with Professor of Earth Sciences Ben Edwards. 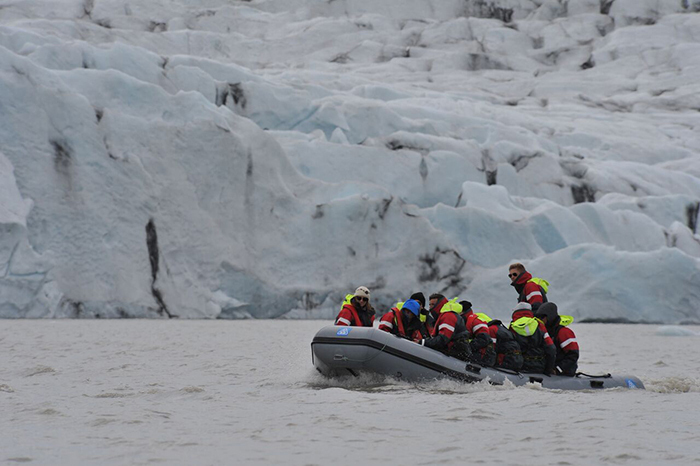 While a native Icelander provided the group with information about the country’s rich history and culture, Edwards offered a view of the natural wonders through the eyes of a dynamic global scientist who travels to Iceland regularly to perform field research. Edwards studies the interactions between volcanoes and ice, including the formation of pillow lava and cooling joints, as well as mineralogy, environmental hazards, scientific history and the influence of plate tectonics. During the trip, he explained what Iceland’s geologic features tell us about our environment, past and present, and about the Earth’s history. He also described emerging research, including his ongoing work as part of an international research team, and introduced alumni to students who were just wrapping up a fieldwork trip. Lynda Bingaman Mayer ’61, a retired high-school German teacher, was thrilled by the chance to dig deeper into a subject she first explored when she took three geology courses as a Dickinson English major—coursework that led her to an entry-level publishing job at the U.S. Geological Survey, back when the idea of plate tectonics was just beginning to catch on. She and her husband, Charlie ’58, had learned a bit about Iceland during a group tour in 2000 and were eager to get more in-depth information while again drinking in the black-sand beaches and mineral-rich Blue Lagoon. “There were at least 20 jaw-dropping scenes and experiences,” she says, adding that she particularly enjoyed learning why volcanoes come in different shapes, how lava flows can be “read” and that a hot spot under the Icelandic ice cap is believed to have sparked the island’s formation. She adds that because Iceland is young, compared to the Earth’s 4.6 billion-year-old history, it provided an awe-inspiring visualization of what the Earth might have looked like several billions of years ago, as well as what life might be like on other planets. “It’s hard to wrap one’s mind around that,” she says. Jan Monks Herrold ’68, P’03, was considering taking a trip to Scotland when she saw an announcement for the Dickinson alumni trip and signed up, along with husband John P’03. A community leader and retired college administrator who majored in math at Dickinson, she seized the opportunity to learn something new in a small-group setting that allowed her to connect with fellow alums. Within just a few days of returning home, Herrold realized just how much information she’d also absorbed along the way. Registration is now open for Dickinson's next Alumni Global Adventure, Málaga, Province of Beauty and Taste: A Feast for the Eyes and the Palate, April 22-28, 2018. "Fieldwork of Ice and Fire"